The new portable product comes in four flavors. If a single pint of low-calorie ice cream is something you just can’t resist finishing at once, Halo Top is here for you ... again. The brand's newest treat? Ice cream pops with just 50-60 calories per serving. Four new flavors of Halo Top Pops are now available on the ice cream maker's website. They include: mint chip, peanut butter swirl, chocolate chip cookie dough and strawberry cheesecake. We popped the question and our sticks said yes! Introducing #HaloTopPops, the same ice cream you know and love, now with 100% more stick. Each treat has just 3 to 5 grams of sugar. By comparison, most of Halo Top’s bestselling pints have between 280 and 360 calories — or between 70 to 90 calories per serving — so if you're looking to cut back on extra calories during dessert, the pops are the way to go. 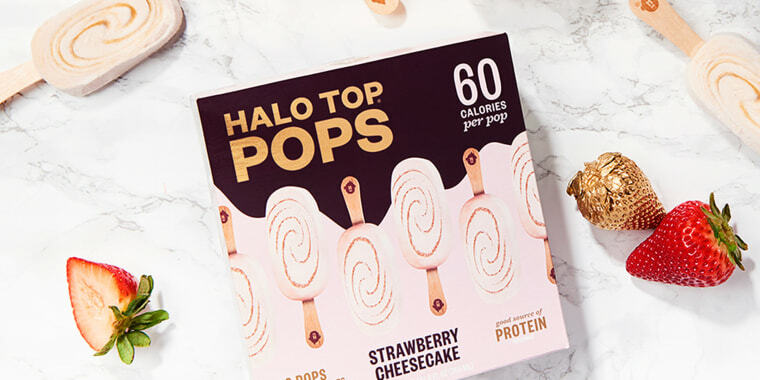 “We love ice cream in all forms, and these pops seemed like the next logical place to take our brand,” Doug Bouton, president and COO of Halo Top Creamery, told TODAY Food. Another reason to try Halo Top Pops? The strawberry cheesecake flavor is available only in pop form. So if you're craving real cheesecake, these pops will offer a similar taste but with far fewer calories. Last summer, Halo Top released its peanut butter and jelly flavor, which was a hit with TODAY staffers who loved the combination of strawberry jam and creamy peanut butter in every bite. For now, Halo Top Pops are available only online in multipacks. Customers may choose four packs of any flavor for $48 or eight packs for $68 (each pack has six pops). Starting this month, however, these snack-size treats will be available as individual boxes (for $6) in parts of the Midwest, Texas and California. The company expects the pops to be available nationwide in May. If you happen to be in the New York City area soon, you'll have a chance to grab a pop for free this month. To celebrate the launch of its Halo Top Pops, the team is giving away 30,000 samples in Manhattan for one day: Valentine's Day. Head over to Grand Central’s Vanderbilt Hall on Feb. 14 to snag a free pop but be prepared to reveal your relationship status. There will be four lanes — one for each of the new Halo Top Pops’ flavors: "Singles" will get strawberry cheesecake; choose "taken" if you want peanut butter swirl; if "It’s Complicated," the brand will sweeten it up with mint chip; and if you are "Just Hungry," chocolate chip cookie dough will be eagerly awaiting your arrival. If you aren’t in New York City, no worries. There's a similar deal available online. On Feb. 14, head to the company’s online store, share your relationship status to pick your flavor and, if you're among the first 1,000 people to enter your info, you will be able to score a free pack of pops using the code HALOTOPPOPS at checkout.